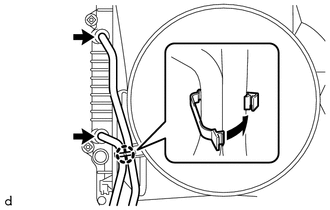 (a) Engage the 2 hooks and temporarily install the radiator assembly to the radiator support sub-assembly. (b) Install the radiator assembly with the 4 bolts. (a) Install the fan pulley to the engine water pump assembly. (b) Place the fan shroud together with the fan with fluid coupling between the radiator assembly and engine assembly. Be careful not to damage the radiator core. (c) Align the paint marks on the heads of the water pump stud bolts with the paint marks of the same color on the outer edge of the fluid coupling flange and install the fan with fluid coupling to the engine water pump assembly. (d) Temporarily install the fan with fluid coupling to the engine water pump assembly with the 4 nuts. Tighten the nuts as much as possible by hand. 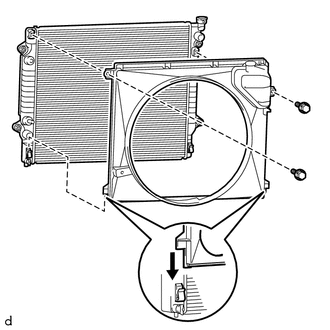 (e) Engage the 2 guides of the fan shroud to the radiator assembly as shown in the illustration. (f) Install the fan shroud to the radiator assembly with the 2 bolts. (g) Install the fan and generator V belt (See page ). 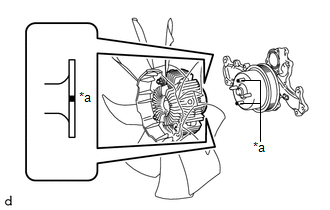 (h) Tighten the 4 nuts of the fan with fluid coupling. (1) Connect the 2 transmission oil cooler hoses to the radiator assembly and slide the 2 hose clips to secure them. 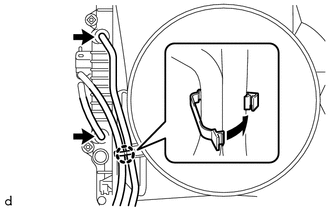 (2) Engage the clamp to install the 2 transmission oil cooler hoses to the fan shroud. 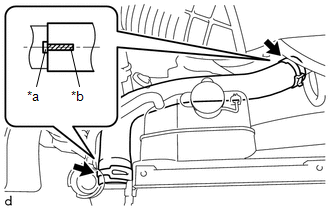 (a) Connect the radiator reserve tank hose to the radiator assembly. (a) Install the No. 2 radiator hose to the radiator assembly and slide the hose clip to secure it. Connect the No. 2 radiator hose so that the paint mark on the No. 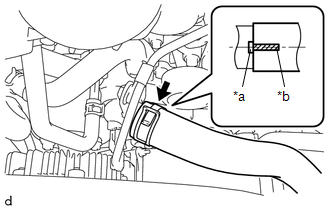 2 radiator hose is aligned with the protrusion of the radiator assembly as shown in the illustration. (b) Connect the No. 2 radiator hose to the water inlet with thermostat sub-assembly and slide the hose clip to secure it. (a) Install the No. 1 radiator hose to the water outlet and radiator assembly and slide the 2 hose clips to secure it. Connect the No. 1 radiator hose so that the paint marks on the No. 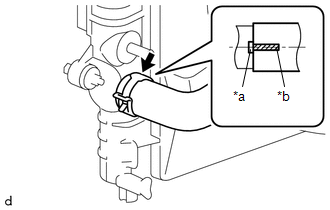 1 radiator hose are aligned with the protrusions of the water outlet and radiator assembly as shown in the illustration. (a) Engage the 3 claws and install the radiator side deflector LH. (a) Engage the 3 claws and install the radiator side deflector RH.